Animal husbandry, also known as animal science, is the agricultural practice of breeding and raising livestock. An outgrowth of agricultural practices and techniques of farmers for centuries, the commercialization of agriculture and the advances of veterinary science during the twentieth century helped to establish a recognized scientific discipline that is taught in many universities and colleges and used all over the world. 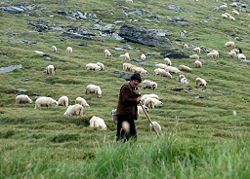 Shepherd with his sheep in Făgăraş Mountains, Romania. Because of agriculture, cities, as well as trade relations between different regions and groups of people, developed, further enabling the advancement of human societies and cultures. Animal husbandry, as well as other forms of agriculture, has been an important aspect of economics throughout the centuries prior to and after the Industrial Revolution. Sustainable development of world food supplies impacts the long-term survival of human beings and all domesticated species, so care must be taken to ensure that agricultural methods remain in harmony with the environment. Breeding animals requires adequate care and concern for the impact of genetic modification, pollution, and hybridization on the species. The ethical aspects of breeding animals in captivity have also become matters of greater concern as humankind advances in awareness of its responsibility toward the environment and all living things. 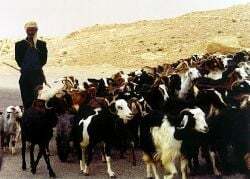 A man herding goats in Tunisia. The first animals to be domesticated were sheep, goats, pigs, cattle, and horses in ancient Middle Eastern and Asian societies. The domestication of these animals marked an important watershed in the history of agriculture, as it allowed societies to move away from hunter-gathering traditions. Early agriculturists used animals extensively for labor, food, and raw materials, but also realized, without the help of modern understanding of genetics, that specific breeding practices could potentially yield more beneficial traits in animal offspring. Their methods of breeding were based solely on observable traits, so that animals with obviously beneficial traits were bred to produce offspring with combined desirable characteristics. Commonly, this was achieved by pairing two desirable animals during times of female ovulation, and allowing the animals to breed. However, since two healthy animals will not always breed on their own, artificial insemination was developed, first employed by the Arabs in fourteenth century. Others attempted similar techniques, particularly early European scientists interested in genetics. While these methods were sophisticated for the times they were used, they often produced mixed results. In the twentieth century, with the advent of genetic science, the manipulation of animal genes with the desired result of more advantageous offspring became more successful. By understanding the mechanics of genetic transmission from parent to offspring, scientists were able to breed animals in a more precise manner. Coupled with new advances in general veterinary science, nutrition, and the commercialization of farms, animal husbandry became more systematic, so as to yield higher quality animals, in shorter time frames, and for less money. More recent trends have also attempted to bring in older traditions involving emotional care and attachment to the animals cared for the benefit of their development. Domestication refers to the process of taming a population of animals (although it can also be used to refer to plants) or even a species as a whole. Human beings have brought these populations under their care for a wide range of reasons: To produce food or valuable commodities (such as wool, cotton, or silk), for help with various types of work, transportation, and to enjoy as pets or ornamental plants. Animals domesticated for home companionship are usually called pets while those domesticated for food or work are called livestock or farm animals. Flexible diet—Creatures that are willing to consume a wide variety of food sources and can live off less cumulative food from the food pyramid (such as corn or wheat) are less expensive to keep in captivity. Most carnivores can only be fed meat, which requires the expenditure of many herbivores. Reasonably fast growth rate—Fast maturity rate compared to the human life span allows breeding intervention and makes the animal useful within an acceptable duration of caretaking. Large animals such as elephants require many years before they reach a useful size. Ability to be bred in captivity—Creatures that are reluctant to breed when kept in captivity do not produce useful offspring, and instead are limited to capture in their wild state. Creatures such as the panda and cheetah are difficult to breed in captivity. Pleasant disposition—Large creatures that are aggressive toward humans are dangerous to keep in captivity. The African buffalo has an unpredictable nature and is highly dangerous to humans. Although similar to domesticated pigs in many ways, American peccaries and Africa's warthogs and bushpigs are also dangerous in captivity. Temperament which makes it unlikely to panic—A creature with a nervous disposition is difficult to keep in captivity as they will attempt to flee whenever they are startled. An animal such as the gazelle, which is very flighty and has a powerful leap that allows it to escape an enclosed pen is not suitable for domestication. Modifiable social hierarchy—Social creatures that recognize a hierarchy of dominance can be raised to recognize a human as its pack leader. Bighorn sheep cannot be herded because they lack a dominance hierarchy, whilst antelopes and giant forest hogs are territorial when breeding and cannot be maintained in crowded enclosures in captivity. A herding instinct arguably aids in domesticating animals: Tame one and others will follow, regardless of chiefdom. Yet, despite long enthusiasm about revolutionary progress in farming, few crops and probably even fewer animals ever became domesticated. Domesticated species, when bred for tractability, companionship, or ornamentation rather than for survival, can often fall prey to disease: Several sub-species of apples and cattle, for example, face extinction; and many dogs with very respectable pedigrees appear prone to genetic problems. Domestication has also threatened human beings with disease. Cattle have given people various viral poxes, measles, and tuberculosis; pigs gave influenza; and horses the rhinoviruses. Humans share over sixty diseases with dogs. Many parasites also have their origins in domestic animals. Animals of domestic origin as well as feral animals sometimes produce fertile hybrids with native, wild animals which leads to genetic pollution in the naturally evolved wild gene pools, many times threatening rare species with extinction. Cases include the mallard duck, wild boar, the rock dove or pigeon, the Red Junglefowl (Gallus gallus) (ancestor of all chickens), and carp. Another example is the dingo, itself an early feral dog, which hybridized with dogs of European origin. Living organisms can also be defined as pollutants, when a non-indigenous species (plant or animal) enters a habitat and modifies the existing equilibrium among the organisms of the affected ecosystem (sea, lake, river). Non-indigenous, including transgenic species (GMOs), may bring about a particular version of pollution in the vegetal kingdom: So-called genetic pollution. This term refers to the uncontrolled diffusion of genes (or transgenes) into genomes of plants of the same type or even unrelated species where such genes are not present in nature. For example, a grass modified to resist herbicides could pollinate conventional grass many miles away, creating weeds immune to the most widely used weed-killer, with obvious consequences for crops. Genetic pollution is at the basis of the debate on the use of GMOs in agriculture. A Genetically Modified Organism (GMO) is an organism whose genetic material has been altered using the genetic engineering techniques generally known as recombinant DNA technology. Genetic Engineering today has become another serious and alarming cause of genetic pollution because artificially created and genetically engineered animals in laboratories, which could never have evolved in nature even with conventional hybridization, can live and breed on their own and, what is even more alarming, interbreed with naturally evolved wild varieties. 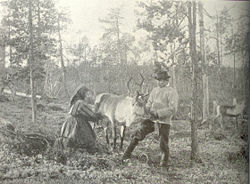 Reindeer being milked by Sami people. Swineherd: A person who cares for hogs and pigs (older English term: Swine). Shepherd: Usually a person who cares for sheep. However, in previous years, it was common to have herds which were made up of both sheep and goats, in which case the term shepherd was still employed. Goatherd: Someone who cares primarily for goats. Cowherd/Cowboys: Refers to those who raise, milk, and slaughter cattle. 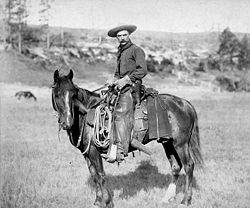 In more modern times, the cowboys or vaqueros of North and South America ride horses and participate in cattle drives to watch over cows and bulls raised primarily for food. 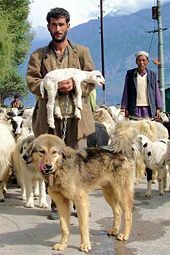 Herder: A generic term for anyone who tends to a herd of animals not listed above, such as Camels, yaks, and in Latin America, llamas and alpacas. Equestrian: A person who breeds and takes care of horses. Breeders: Generic term for anyone who specializes in the breeding of agricultural animals. More often, breeders are trained in specialized techniques, such as artificial insemination and embryo transfer, and are therefore independent hires of the usual farm staff. Ethical husbandry. A wounded Norwegian reindeer is moved on a snowmobile sled. Courtesy altapulken.no. There are contrasting views on the ethical aspects of breeding animals in captivity, with one debate being in relation to the merits of allowing animals to live in natural conditions reasonably close to those of their wild ancestors, compared to the view that considers natural pressures and stresses upon wild animals from disease, predation, and the like as vindication for captive breeding. Some techniques of animal husbandry such as factory farming, tail docking, the Geier Hitch, and castration, have been attacked by animal welfare groups as inhumane, unsanitary, and counterproductive to the overall benefit of society. Some of these practices also are criticized by farmers who use more traditional or organic practices. Genetic engineering is also controversial, though it does not necessarily involve suffering. People who believe in animal rights generally oppose all forms of animal husbandry. Animal husbandry and animal sciences are taught around the world in colleges and universities. Students of animal science sometimes go on to pursue degrees in veterinary medicine following graduation, or pursue master's degrees or doctorates in disciplines such as nutrition, genetics and breeding, or reproductive physiology. A strong demand for knowledge and experience in the science of breeding and raising animals in the world wide agricultural markets helps graduates of these programs find work in the veterinary and human pharmaceutical industries, the livestock and pet supply and feed industries, as well as in academia. ↑ The Columbia Electronic Encyclopedia, Animal Husbandry. Retrieved November 5, 2007. ↑ World of Genetics, Animal Husbandry. Retrieved September 17, 2007. ↑ World of Invention, Animal Breeding. Retrieved September 17, 2007. ↑ The Veterinary Dictionary, Animal Husbandry. Retrieved November 5, 2007. ↑ Bologna University, The many facets of pollution. Retrieved September 29, 2007. ↑ PETA, About PETA. Retrieved September 19, 2007. Domesticating Animals by John H. Lienhard. Evolution and Domestication: Selection on Developmental Genes?. In situ conservation of livestock and poultry. By Elizabeth L. Henson. 1992. Food and Agriculture Organization of the United Nations and the United Nations Environment Program. Use of Domestic Animals in Zoo Education.